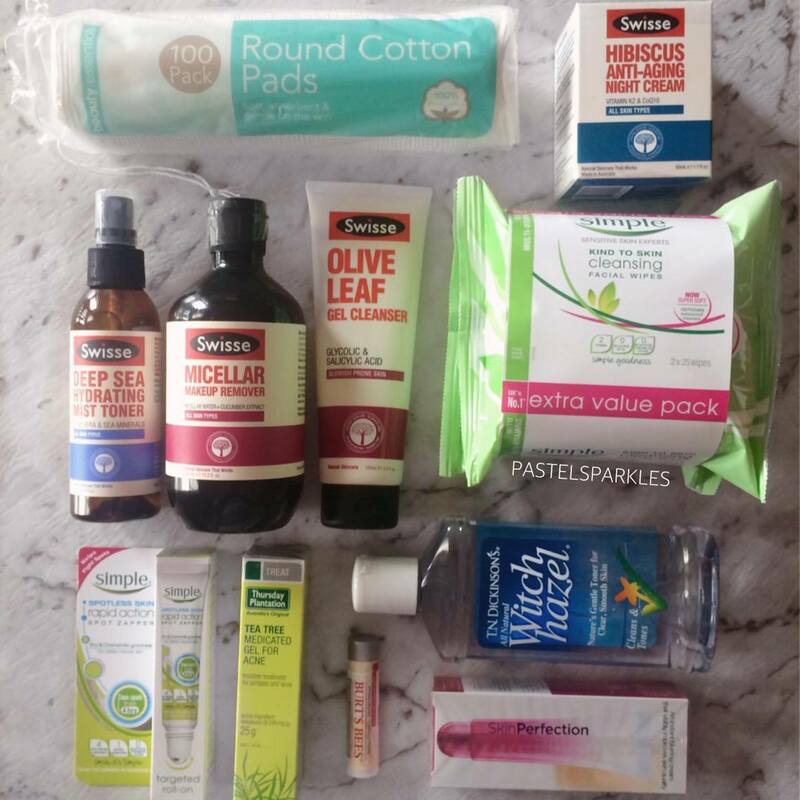 Priceline 40% off of Skincare Haul! I picked up quite a few things. I almost have a completely new skin care routine out of these new products haha. I was really keen to get my hands on some more of the Swisse skincare range after picking up the Manuka Honey mask. I also was looking for a spot treatment because I think my LUSH Grease Lightning is probably due to be thrown away by now. Anyway, let’s get into why I purchased each item and see how much I saved! I really like my Burt’s Bees Sensitive Night cream but it is possibly too light weight for a night cream, for me. I like to have something really sitting on my face and slowly soaking in over night so my skin is really hydrated and well nourished when I see it again in the morning. This night cream is much thicker than the Burt’s Bees one although I didn’t know that prior to purchasing. I really just wanted a basic routine from Swisse and this was the night cream I picked! It is good to get into anti-aging products early! I wanna look 20 my whole life. Again, I really like my Burt’s Bees alternative to this product but I wanted something from the Swisse range. This product foams upon application, unlike the Burt’s Bees one that I’ve been using over the last month. This cleanser makes the skin feel squeaky clean and I am so happy I picked it up. Especially for only $6. This is a cheaper alternative to my LUSH one and but it is made with different ingredients. This also doesn’t have perfume in it so it is already more friendly to sensitive skin pals. I won’t tell you that you are going to be free from a reaction to this because you may be allergic to the essential oils that go into this product but it is a much safer product for your skin than the LUSH one. I probably will still use both haha. I really wanted a micellar water or eye makeup remover because my mascara doesn’t come off with my face wipes and of course, I wanted to try the Swisse one because it doesn’t have any of the nasty stuff that other micellar waters have. This has a really nice smell as well so it is a really pleasant experience when you use this product. And it does take off my eye makeup really well without hurting my lashes. I watched someone’s skincare routine the night before I did my shop because I wanted to plan things to purchase and I came across this product and I’d heard a lot of good things about it so I thought I’d just give it a go because I had a whopper of a blind pimple on my cheek this week and I just need it to go haha. I have a bad pimple popping habit and hopefully acne treatments like this will help me curb that habit. This product keeps popping up in the beauty groups on Facebook because it is such an inexpensive natural toner. This product has two ingredients but it can give people allergic reactions so I’m being brave and testing it. I heard that you should still use this with a regular toner so I’m going to use it with my spray toner waters. Witch Hazel is really good for a lot of things so I’m excited to see if this works out for me! Another spot treatment in case the other one doesn’t agree with me. This was also recommended on one of the Facebook groups. It says that spots will reduce in as little as 4 hours, I doubt that but I thought it was worth giving it a go for the price. These wipes may not be the best for your skin but they remove my makeup the best out of the face wipes at Priceline, in my opinion. I like to use face wipes as my initial makeup removal step. I usually use it on my face and neck areas, avoiding my eyes because that’s what I use the micellar water for. I’d recommend them over the cheaper ones that you can get at Priceline and over some of the more expensive ones, like the Burt’s Bees ones. No real reason for picking this up other than I wanted another lip balm haha. I love the Burt’s Bees lip balms and I definitely think that they’re worth the full price but at 40% off, it is hard to resist them! My lips have been pretty cracked lately because I caught a summer cold and then had continuous hay fever so I really wanted another lip balm that was going to help me get back to smooth, soft lips. Now I wouldn’t call this a skincare item because it is used as a pore filler, similar to Benefit’s Porefessional so I use it as a primer, but I won’t argue with it because I got 40% off this product. I love this product. I don’t think I could live without it. There was no sale on this product but I was running out of cotton rounds so I picked this one up! I was able to save $50.24! I was able to pick up so much stuff for such a good price and I am SO excited to use everything and have the most beautiful skin ever hahaha. I hope that you enjoyed reading what I picked up during the skincare sale. I hope that you found everything that you wanted to pick up!